One of the most frequent things I’m asked about my Ho Chi Minh Trail trip is why I chose to travel alone, and what it was like. Here are a few thoughts on the matter. 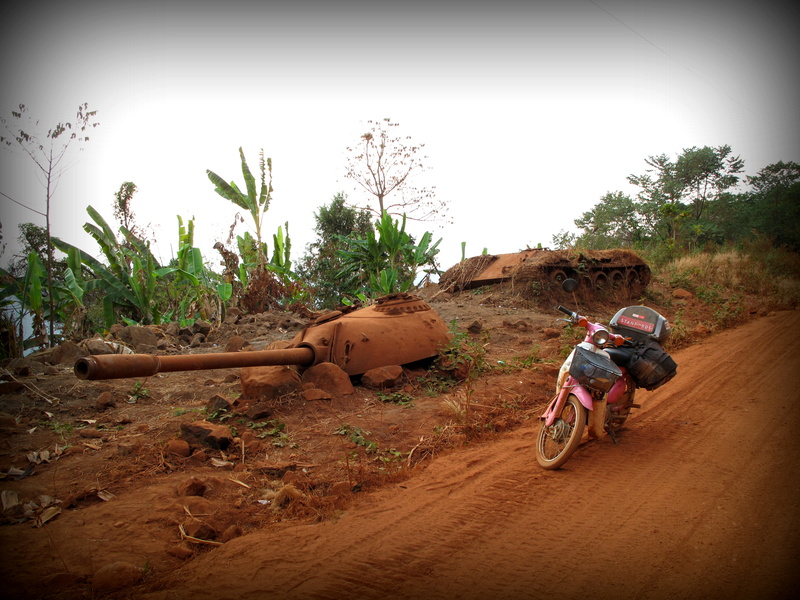 From the moment I decided to explore the remains of the Ho Chi Minh Trail by motorbike I was determined to do it alone. Bar a stint backpacking around India in my early twenties, all my travels had been with other people. In 2006 my dear friend Jo and I drove a bright pink Thai tuk tuk a record-breaking 12,561 miles from Bangkok to Brighton. Aside from an altercation in Yekaterinburg over Jo’s snoring we’d got on brilliantly, splitting the driving and responsibilities, making each other laugh and mopping up the odd tears. Then there was a 3,000 mile circumnavigation of the Black Sea with my boyfriend Marley, where I’d too easily fallen into the dependent female role; never so much as picking up a spanner as we trundled through six countries. The following year, in a shivering attempt to cajole an old Ural to the Russian Arctic Circle, I’d been with two fearless male friends, one a tap-dancing comedian, the other a consummate mechanic. On every other expedition I had organised, or television programme I had produced, there had been translators, drivers, medics and crew. It doesn’t mean that each and every mission wasn’t difficult in some way, but having other people around had greatly mitigated the risk and adversity. My Trail mission was fraught with potential dangers. Unexploded ordnance left over from the Vietnam War littered my route through Vietnam, Laos and Cambodia. Cerebral malaria, dengue fever and dysentery were prevalent. The trees slithered and crawled with deadly vipers, venomous scorpions and spiders bigger than my hand. And although tigers, bears, panthers and clouded leopards were sadly now extremely rare, an attack by one wasn’t inconceivable. Whatever happened, it was unlikely to be an easy trip. But none of this was enough to put me off going alone. Company makes us idle, gives us masks to hide behind, allows us to avoid our weaknesses and cushion our fears. By peeling away these protective layers I wanted to see how I would cope, find out what I was really made of, physically and emotionally. Would I be able to fix my bike if it ground to a halt in the middle of a river? How would I handle nights spent in a hammock in the depths of the jungle? What would it feel like to ride into a remote tribal village alone? How would I react in times of real adversity? And could I outstrip Usain Bolt if confronted by a many-banded krait? A month before I left for Vietnam I’d been relaxing with a cup of tea during a television shoot in Tanzania when I spied something red and black crawling across my shoulder. I screamed and leapt a foot in the air, sending tea and filming equipment flying into the dust. After several hysterical seconds on my part, the camera assistant confirmed it was no more than a harmless beetle. ‘Jesus – and you’re going to Vietnam in a few weeks?’ he laughed. I couldn’t go through life acting like a character from The Only Way is Essex every time I encountered something with more than four legs. Nor did I want to turn into one of those women who relies on their other half so much they end up unable to change a light bulb. If I always travelled with other people, I would never have to confront my weaknesses. There would be times when I’d want to share a laugh or a moment with Marley or have a stiff gin with friends. But hopefully there would also be moments of simple achievement. It was times like these that going solo were all about. I never regretted my decision, and oddly it was often on the toughest days that I really relished the solitude and what it taught me about myself. As I hauled my little Cub through thigh deep mud, forced her through rivers and ground and clanked up steep ladders of rock, I was 100 per cent engaged, focused, determined. Nothing else in the world mattered except that place and moment in time. In a curious sort of way, it was a form of extreme mindfulness. Another wonderful aspect of being alone was the fact of having no one to complain to. If I was with Marley I probably would have grumbled about that gash on my shin, the execrable mud, being tired, that weird noise Panther was making. But so what? So what if my leg hurt? What use would telling him achieve? So what if I was tired or hot or cold? He couldn’t change that. My journey made me realise how complaining has become so endemic in our western spoilt society; it’s too hot, too cold, too crowded, too expensive; I’ve got a headache, I’m tired, I had a bad day at work; the person in front is driving too slowly, and so on. It’s so insidious we hardly register it, this drip, drip, drip of negativity that feeds into everyday life. So many of us are guilty of it, yet we hardly notice. I vowed to try and stop complaining when I arrived home. Towards the end of the two months I met a Polish backpacker in Cambodia who asked me if I’d been lonely. ‘I mean, what did you do in Laos when there was no one to talk to?’ he questioned. I considered this, thinking about those nights in remote tribal villages, those long days of riding. And the truth was that not once had I felt lonely. When I hadn’t been tinkering with my bike or fiddling with equipment I’d spent contented evenings just sitting, watching, thinking, writing. I had revelled in the simple art of observation, undistracted by companionship or television. Consumed by the purpose of my journey, I hadn’t had time to feel lonely. Backpacking can be a purposeless occupation; drifting between towns, islands, hostels and air-conditioned buses, only talking to people if you have the courage. I may have been alone in the jungle, but I always had the Trail. My experience didn’t fundamentally change me, but I did learn a few things on that journey, insights that could only have come from travelling alone. In times of adversity, when the mire and the mountains had conspired to beat me I felt like I’d faced myself and passed the test. I hadn’t cried or given up, I’d kept on going, mile by muddy mile. Whatever the future held, I would always have the knowledge that I’d cajoled an ailing twenty-five-year-old Cub over the Truong Son mountains. If I could do that, I hoped I could overcome a lot of life’s difficulties. It certainly isn’t the last time I’ll be going solo. You can read more about this trip in my recently published book, A Short Ride in the Jungle: the Ho Chi Minh Trail by Motorcycle. Signed copies are available from me for £10 or you can purchase it through Amazon (as an ebook and paperback) or at Stanfords, Waterstones and all good bookshops. To have a gander at what people like Dervla Murphy, Ted Simon, Lois Pryce and Jason Lewis have said about it click here, or look at the Amazon reviews here. 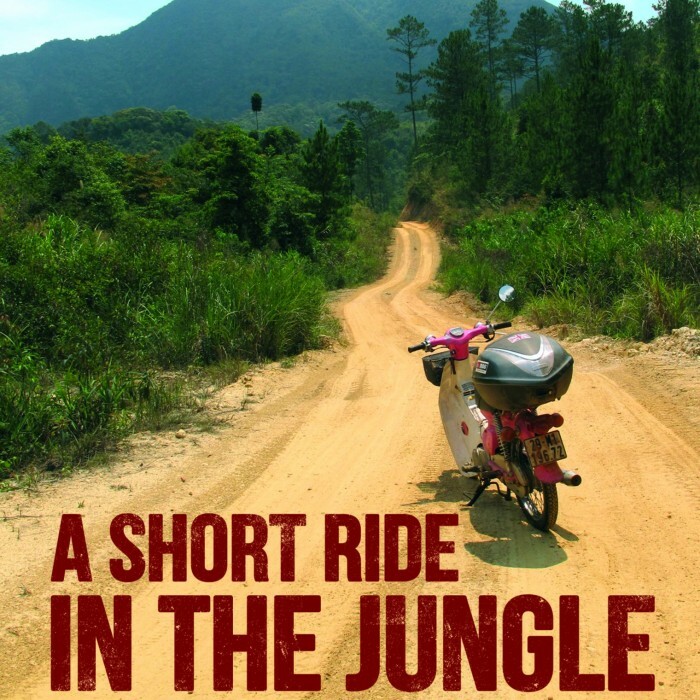 Tags:A Short Ride in the Jungle adventure Antonia Bolingbroke-Kent female solo travel going solo Ho Chi Minh Trail Honda C90 Honda Cub Laos motorbike adventures the advantages of travelling alone travelling alone Vietnam Vietnam War why travel alone? Previous PostSo you want to be a travel writer? 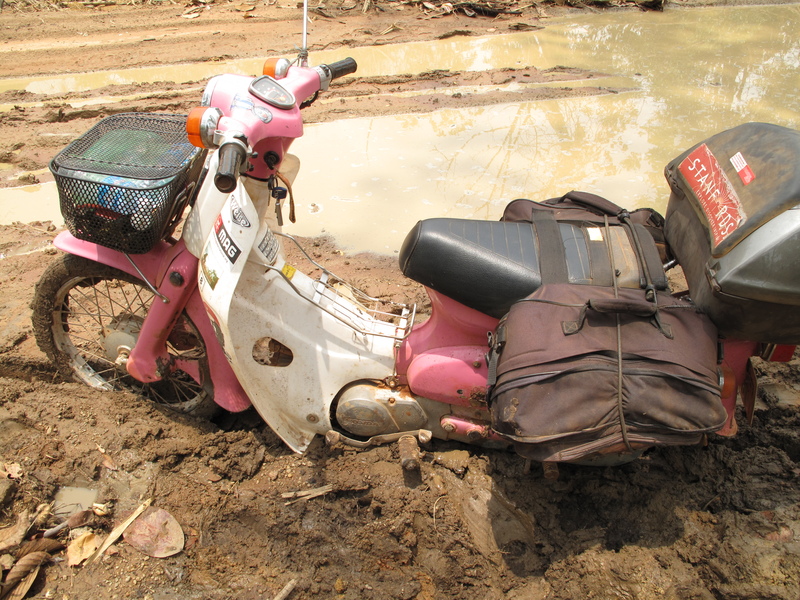 Next PostFancy motorcycling the Ho Chi Minh Trail? Here’s how….